The immense desert areas of Australia used to be called its 'dead heart'. Today we realise that deserts and savannahs have complex ecosystems, with plants and animals that have adaptations enabling them to survive there and not in any other location. 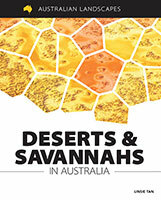 Deserts are now iconic symbols of Australia and are no longer dismissed as useless, empty wastelands. Although colonial explorers found the deserts harsh and unforgiving, Indigenous Australians learned how to live in the deserts, find water and prosper. Learn about each of Australia's ten largest deserts and also find out why the Nullarbor Plain is different from all of them.